Love Art? Visit the silent art auction @ Friday’s Spring Dance Show & buy original art, enamel jewelry, & handmade tie dye T-shirts – all made by EHS Students & Teachers. Come support the EHS National Art Honor Society and Elkins Elite this Friday at the silent art auction and Spring Dance Show. We will be selling original art, enamel jewelry, and handmade tie dye T-shirts all made by Elkins Students and Teachers. All proceeds will go to support the National Art Honor Society. Congrats to Grace Cha for winning a $600 scholarship at the state art competition! Grace Cha at the State Scholastic Event at Bryan High School on April 5, won a $600.00 scholarship for this self portrait drawing completed in an hour and a half. Congrats to Esthere Amaku for competing at state in art! Esthere Amaku advanced to the State Visual Art Scholastic Event at Bryan High School on April, 5. with her mixed media self portraits. Congrats to Grace Cha for winning two state art medals! 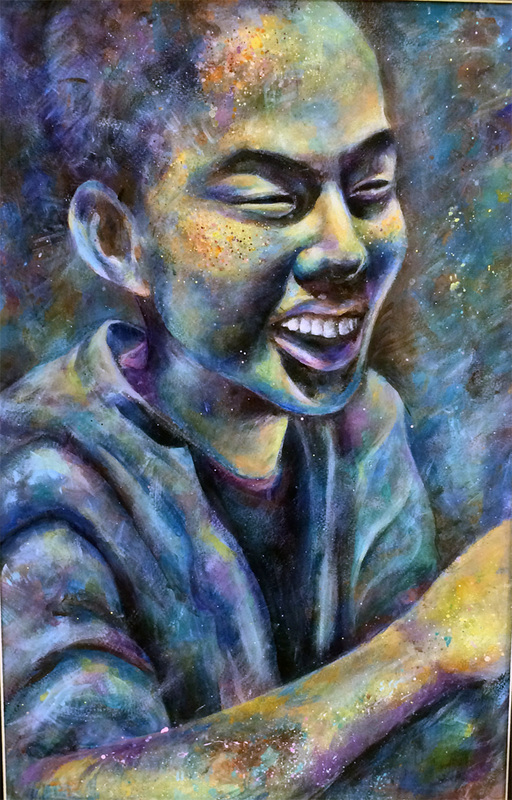 Grace Cha won state medals at the April 5th Visual Art Scholastic Event with her mixed media and acrylic portraits! Congrats to Grace Cha. Her “The Apprentice” painting sold at the Houston Livestock Show and Rodeo Student Art Auction for $23,000! Grace will get a percentage of the $23,00 and the remainder will go towards scholarships. 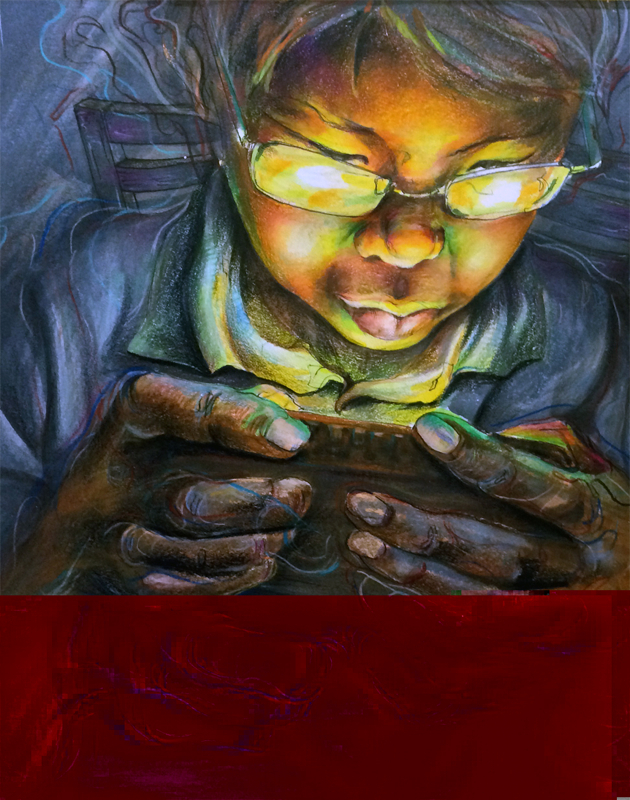 Congrats Esther Amaku and Grace Cha for advancing to The State Visual Art Scholastic Event in April! Elkins High School Students participated in the Visual Arts Scholastic Event on Saturday, February 22nd. There were several students that earned a 4 (the highest possible). The Fine Arts Department would like to especially congratulate Esther Amaku (one art piece) and Grace Cha (two art pieces) for advancing to The State Visual Art Scholastic Event in April. Congrats to Grace Cha (Gold Medal), Esther Amaku (Finalist Ribbon) and the 16 other Elkins Knights who were recognized at the Fort Bend Rodeo Art Competition. The following students entered a piece of art in the Saturday at Clements H. S. Third Place: Jazzamatzz Gomez, Charlene Sigua Sonia, Gantt, Manon Hughes, Manisha Kunnacherry, Camdyn Brocail, and RushilMistry. Second Place: Joelle Shephard, Gustavo Zucco, Amber Tunstall, MacKenzie Boudreau, Leslie Reglos, Samantha Chan, Linda Li, Jiayu Wang, and Gennesis Gonzales, Esther Amaku (12th grade) won a Finalist Ribbon Saturday at the Fort Bend Rodeo Art Show at Clements H.S. 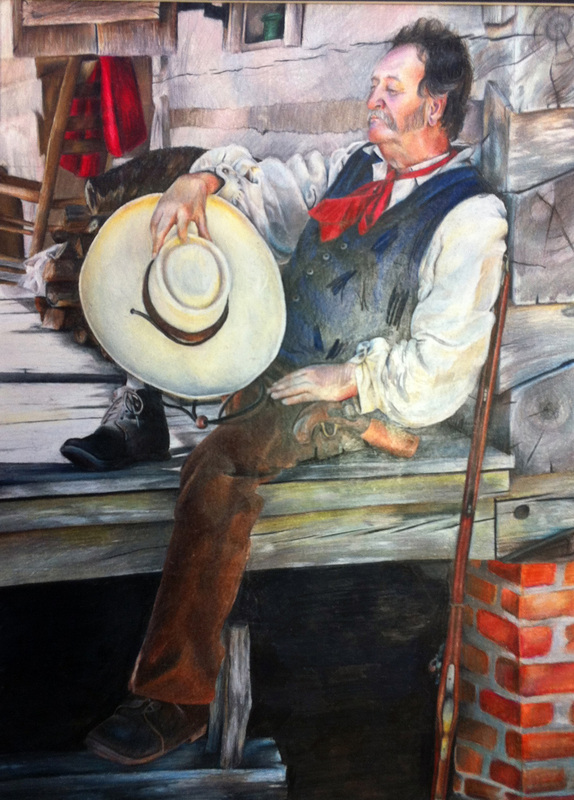 Her colored pencil drawing titled "Pioneer Sunday" was considered for the top three pieces of art for Ft. Bend ISD. Grace Cha (11th grade) won a Gold Medal at the same show. 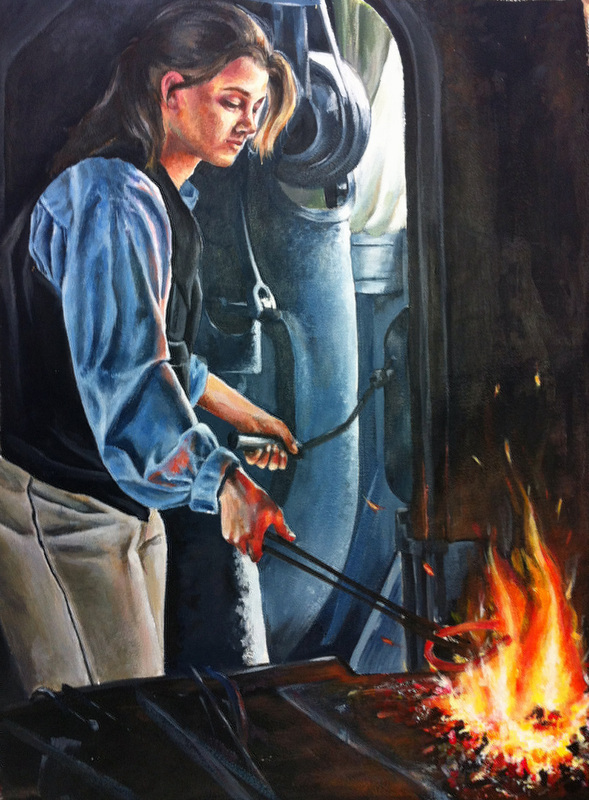 Her acrylic painting titled "The Apprentice" earned one of the top three spots for Ft. Bend. It will now advance to the Houston Livestock Show and Rodeo Student Art Contest. Hopefully it will be selected for the auction and will earn Grace a minimum of $2000.00. Congrats to Grace Cha whose colored pencil drawing was auctioned at the Houston Livestock Show and Rodeo Art Auction for fourteen thousand dollars! Elkins is thrilled for you, Grace! Grace Cha won the prestigious Glassell School Scholarship at the Houston Museum of Fine Arts and The Western Art Scholarship at the Houston Livestock Show and Rodeo Student Art Competition! This summer Grace will go for 4 weeks to Kerville, TX. to study painting and sculpture taught by acclaimed western artists. She was also notified that her colored pencil drawing will be auctioned this Sunday for at least $2,000 and probably more. Congratulations to Grace Cha , not only did she win two medals, both of her art pieces advanced to the State Visual Arts Scholastic Event which will be held in April at Bryan.